Each year, I resolve to make good use of Lent, and each year, I fall short. So, this go 'round, I'm trying something a little different: Since I can't physically go on retreat for the next 40 days, I'm going to fire up the ol' imagination and do my darndest to spiritually and mentally act as though I'm on retreat; on a journey with Easter as the destination. I thought about the elements involved in the retreats I've gone on for real: No Internet access or excessive diversions (games, TV-watching, etc. ), wholesome and simple meals, and a mindful focus on spiritual reading, prayer, sharing with others, reflective writing, and spiritual talks. So, I'm going to try to recreate that atmosphere, as best I can, in my daily life on this year's Lent Trek. No Internet Access. To set the scene, no playing around on the Internet, save for checking email (a must in relation to my Secular Franciscan fraternity and family) and specific sections in my feed reader (as described in the "Sharing with Others" section below). No Excessive Diversions. I hardly watch it anyway, but no TV. While that's no big deal, it'll be harder for me to pull back from socializing in Facebook (where I also enjoy playing a few games), Plurk, and Twitter. Wholesome Meals. All the retreats I've been on offer tasty, wholesome, and simple meals -- no junk food or candy. So, none of that here. Spiritual Reading. We're picking up a copy of B16's forthcoming Jesus of Nazareth: Holy Week: From the Entrance Into Jerusalem To The Resurrection, which I'll read through the season. I'll also dip into In Conversation with God and An Introduction to the Devout Life. Prayer. Once a week (minimum), during lunch, I'll pop over to a parish near where I work and spend a few minutes in front of the tabernacle. Attending daily Mass at least once a week is a goal, too. Reflective Writing. 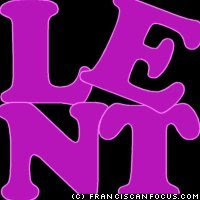 If I'm not a total putz (no promises), I'll try to share my thoughts here as I make my way through Lent. I'll definitely be scribbling in my notebook, though. Spiritual Talks. I'll re-listen to the various talks we have from Lighthouse Catholic Media (especially while driving to/from work), and poke around the talks at the Institute of Catholic Culture. Above all, I'm going to work on cultivating an attitude of mindfulness this season ... of remembering that I'm on a pilgrimage to Easter, and as such, I must be kind and helpful to fellow pilgrims along the way, especially to those who don't recognize -- or flat-out refuse to admit -- that they're also on the journey.